Tokyo Game Show last year left me with the biggest grin on my face and so much video game hype that I could burst. While I feel TGS 2016 left less of an impression on me due to the discussion of games that have been shown excessively (I'm sorry Final Fantasy XV, but I'm looking at you), there were a few games that did catch my eye and got me excited for their release. Ultimately, TGS 2016 showed quite a few games and these are some of my favourites of the JRPGs announced and given trailers this year. Being honest, my hype level for Kingdom Hearts HD 2.8 had really gone down since made it my top game for TGS 2015. This had nothing to do with the game itself, rather that I haven't finished 1.5 Remix so I assumed I wasn't going to play 2.8 until long after I'd finished the 2.5 Remix. This year’s TGS Kingdom Hearts 2.8 trailer may have changed that. 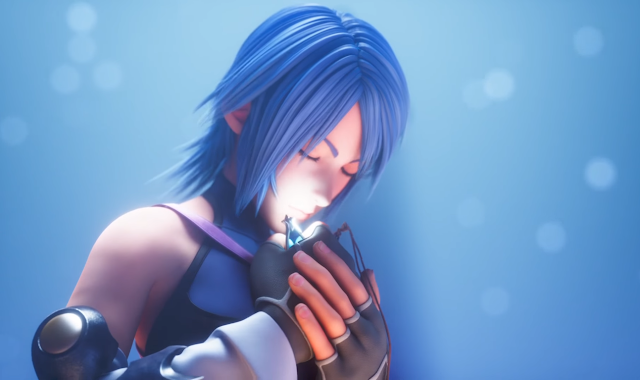 The new trailer backed by a nostalgic, fun remix of Utada Hikaru’s Simple and Clean from the first Kingdom Hearts had some gorgeous footage, bringing in some familiar Kingdom Hearts motifs including the star fruit, falling from the sky and of course, keyblades. Adding to the pretty trailer was the game footage from Kingdom Hearts 2.8, particularly from Back Cover and Birth By Sleep: A Fragmentary Passage being newer additions to the series so getting an extended peak of those is always welcomed. I was particularly excited since it showed gameplay from the latter which will likely be a peek at Kingdom Hearts 3’s (one of the main reasons I bought my PS4) visuals and most importantly, the gameplay. The whole trailer was a great tribute to the three games featured in Kingdom Hearts 2.8 and I hope it keeps me hyped up for its January release. You can pre-order Kingdom Hearts HD 2.8 Final Chapter Prologue from Play-Asia.com! Where Kingdom Hearts 2.8’s trailer got me interested with what it showed, NieR: Automata was dynamic thanks to what it didn't show. NieR: Automata’s trailer shows glimpses of footage backed by lots of screaming and yelling, a very mysterious and dynamic way to introduce NieR Automata. I've never played a NieR game but I've been curious about the series for awhile. After seeing how interesting the trailer looked, I'll be paying attention to this game more. You can pre-order NieR: Automata from Play-Asia.com! Granblue Fantasy has had a lot of magazine coverage in Japan recently, so when it was announced in the PS VR portion of Sony’s conference I was quite surprised to see it was coming to VR as I was under the impression it was a smartphone game. The idea of a JRPG (VRPG?) being available on VR without any gimmicks such as gunplay is kind of refreshing since JRPG gameplay is good enough on its own. I’ve never played Granblue Fantasy and there isn’t a lot of information to elaborate on I wouldn’t specifically buy a VR headset for it, but I would definitely play this if I got the chance as it'd be a cool new way to experience JRPGs. If you enjoyed Digimon Story Cyber Sleuth as much as I did, you may want to try Digimon World: Next Order now that it’s been announced for PS4 next year. Although the trailer was too short to show Next Order’s main gameplay, since I'm currently playing Next Order on my Vita, I can say a few hours in I'm liking it and is had all the raise-your-own-Digimon nostalgia from the original Digimon World games. If you like the idea of raising two Digimon to fight together, feeding them meat daily, taking them to the bathroom after training and filling a city with Digital friends, this is the Digimon game to play. You can pre-order the localised version of Digimon World: Next Order at Play-Asia.com! As the potential final trailer before World of Final Fantasy’s late October release, the TGS 2016 trailer gave a cute extended look into the story and more of the characters we'll get to play with in the fun spin-off game. My favourite part of this trailer was seeing all the summons and enemies of Final Fantasy in the unique art style which somehow even makes Malboros look endearing and cuddly. Cuteness aside, it's nice to see World of Final Fantasy will have its own plot full of emotional ups and downs while still paying homage to the Final Fantasy's before it. I'm looking forward to it more than I expected and I'm sure it'll be a nice game to play before Final Fantasy XV's release. You can pre-order World of Final Fantasy from Play-Asia.com! What were your favourite games from TGS 2016? Was there anything you thought was missing? I can't wait for World of Final Fantasy. When I first saw it, I thought it just looked cute, but it gets more interesting the more I see and hear about it.